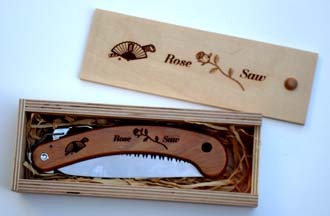 Convenient folding saw with solid hardwood handle. 10" cutting edge with Tri-Edge teeth, 6 teeth per inch. A safety latch prevents accidental closure. Packed in attractive wooden box with slide cover for great gift-giving.